Mary's greatest passion is entertaining friends and guests alike at Poland Mining Camps. Preparing meals in her new kitchen at the Camps' Pavilion, she is famous for her sumptuous, down-home cooking and will make every effort to accommodate any special dietary requirements you may have. 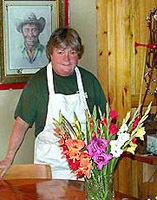 Her love of flowers and gardening often decorate her table and buffet. She is a frustrated rockhound herself, wishing she could collect with her guests every day, but alas her first order of business is to take care of her guest's needs. If you have any special needs, just ask Mary! Dudy had over forty years of experience with the mineralization in Oxford and Androscoggin Counties. Having professionally mined and collected mineral specimens in the many pegmatite quarries you will visit, his expertise and knowledge of the area was second only to his Down East wit and wisdom, hard working spirit and overall generosity. He worked for and/or mined with many of the historically important mining operations and men of the past thirty years. Most recently, he had been mining at Mount Apatite and on occasion worked for the Mount Mica operation. He passed his knowledge and love of mineral collecting to all who knew him. a rewarding vacation adventure - one you will long remember!